Based on feedback from field personnel and to maximize the efficiency of the A/B/C selector switch on the portable radio, we have decided to make some changes with regards to dispatch of units on various talk groups. Effective Friday, February 3, 2012 at 0700 hours, calls that were previously dispatched to 8-Golf-3 or 8-Golf-7 will now be dispatched to 8-Alpha-11 or 8-Alpha-12. Calls that were previously dispatched to 8-Hotel-3 or 8-Hotel-7 will now be dispatched to 8-Charlie-11 or 8-Charlie-12. This should drastically reduce the need to switch zones on emergency incidents. Technical Rescue, Water Rescue and Hazardous Materials calls will continue to be dispatched to the Delta zone. Additionally, we have been made aware of a programming issue on our end that temporarily places the District of Columbia Fire/EMS zones out of service. We are actively working on this issue and should have this fixed soon. We are also looking forward to some new programming features on the mobile that will include a zone up and zone down button. I appreciate everyone’s feedback and patience while we work through this and future improvements. Just after 3:00 pm, Tuesday, January 31, Firefighters from the Bowie area were alerted to a fire on the second floor of a house. Firefighters arrived quickly at the 2-story, Cape Cod, single family home in the 4400 block of Olando Lane and found heavy smoke coming from the top floor. A quick aggressive interior attack by first arriving firefighters contained the fire to a bedroom. The fire was extinguished within 5 minutes of arrival. 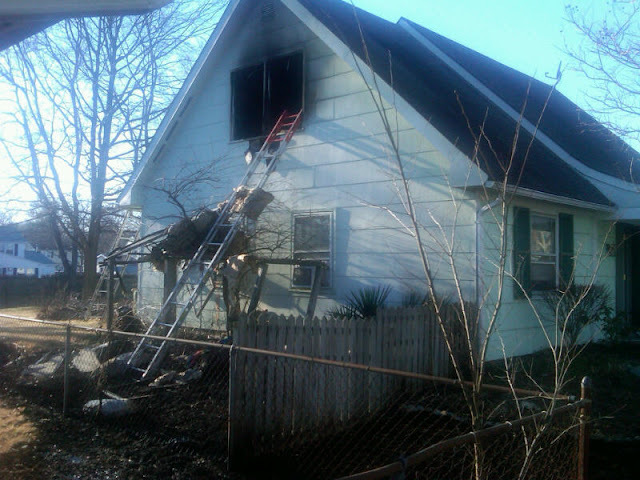 The three adult occupants escaped safely prior to the firefighters arrival. The cause of the fire is under investigation, however, initial indications are that it was accidental and possibly caused by a candle igniting combustibles. Preliminary fire loss is estimated at $35,000. No injuries were reported and the 3 adult occupants will be displaced and are making their own arrangements for temporary shelter. The Knights of Columbus, Sacred Heart Council #2577 recently honored three members of the Prince George’s County Fire/Emergency Medical Services Department. The Annual Public Safety Officer Recognition ceremony was held at the Knight of Columbus in Bowie on Saturday, January 28, 2012. 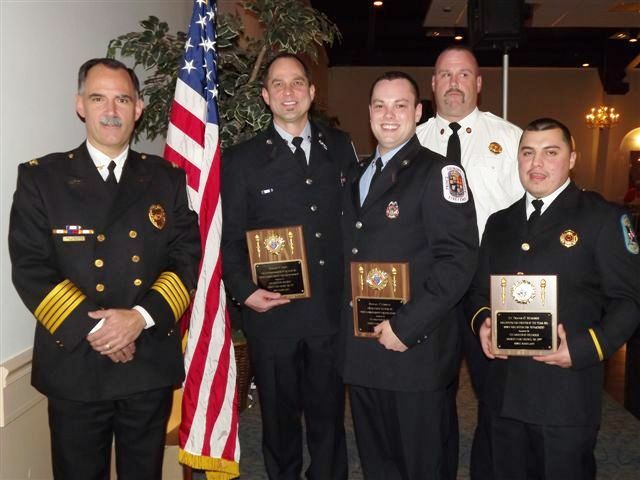 The Fire/EMS Department was honored to have three members awarded by the Knights of Columbus with Firefighter of the Year and Paramedic of the Year distinctions. Fire Fighter Michael Conway and Bowie Volunteer Fire Fighter Travis Murdoch were recognized as the Knights of Columbus Fire Fighters of the Year. The pair was recognized for their efforts where they rescued four occupants trapped on the second floor of their burning home in Bowie. Fire Fighter/Medic Edward Scott was bestowed the Knights of Columbus Paramedic of the Year distinction for his role in helping to save the life of a 5-year-old Clinton girl that had stopped breathing. Prince George’s County Fire/EMS Chief Marc Bashoor and Bowie Volunteer Chief Lee Havens were on hand to help honor the awardees. Fire Chief Bashoor, Fire Fighter/Medic Scott, Fire Fighter Conway, Bowie Volunteer Chief Lee Havens (white shirt) and Bowie Volunteer Fire Fighter Murdoch at the Knights of Columbus Award Ceremony. 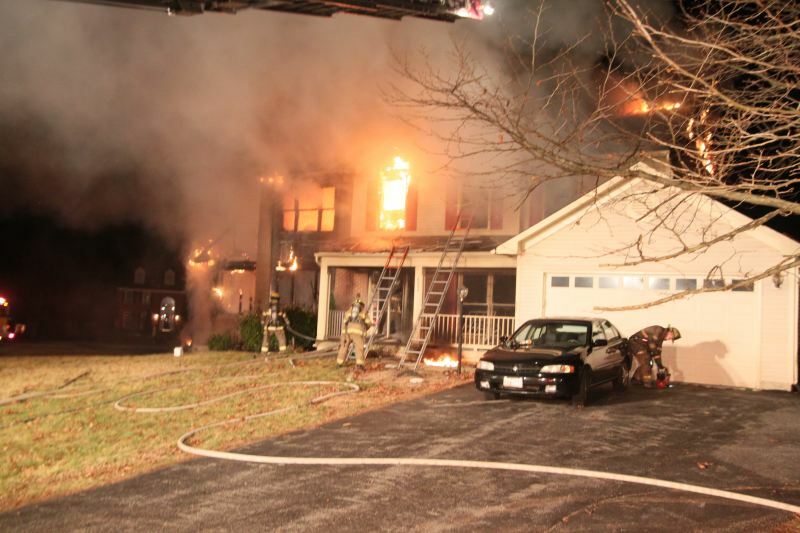 Just before 2:30 am, Sunday, January 29, 2012, Firefighters fought a house fire that caused $300,000 in estimated fire loss. The fire at the 2-story single family home was caused accidentally and attributed to an electrical source. Fire/EMS arrived in the 8000 block of Wingate Drive in Glenn Dale and found a well-advanced fire on both floors of the structure. A Task Force was sounded bringing additional firefighters and resources to the scene to help battle the blaze. It required about 30 minutes to knock down the majority of the fire and another 45 minutes to extinguish all the hot spots. The County Citizen Services Unit was providing assistance to the occupants that will suffer long-term displacement. A firefighter sustained a leg injury while she was battling the fire and was transported in “good” condition to a local hospital. No civilian injuries reported. Firefighters arrived to find a well advanced fire on both floors of the house. Photo courtesy of Jim Davis. Photo courtesy of Jim Davis. Conditions on arrival by Branchville. Photo courtesy of Michael T. Hughes, Branchville Volunteer Fire Fighter. A quick arrival and fast actions by first arriving firefighters to extinguish a fire limited the amount of damage to an apartment building. 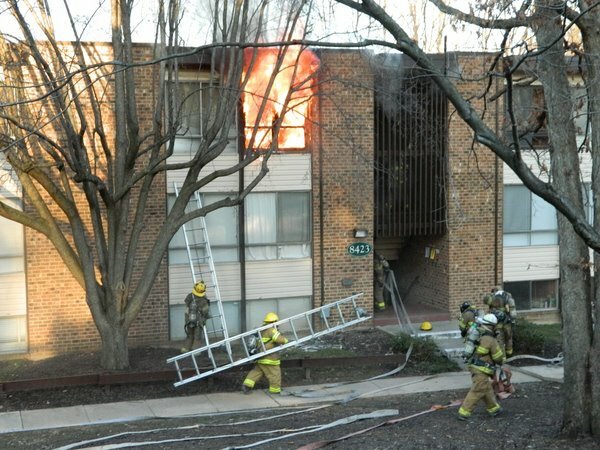 On Saturday, January 28, 2012, at about 4:30 pm, firefighters were alerted to an apartment on fire at 8423 Greenbelt Road in Greenbelt. Fire/EMS units had just cleared another fire incident in Beltsville resulting in some fire units being closer to the reported Greenbelt fire. One of those closer than normal was from Branchville Fire/EMS Company 811 (North College Park). They were one of the first that arrived quickly to find heavy fire coming from the top floor of the 3-story garden style apartment building. Firefighters initiated an aggressive interior attack on the fire by stretching hose lines to the top floor and extinguishing the fire. Searches for civilian occupants still inside were negative and the fire was extinguished and contained to the apartment of origin. In addition to Branchville, Fire/EMS units from West Lanham Hills, Berwyn Heights, Greenbelt, Glen Dale, College Park and Bowie worked to extinguish the fire. There were 35 firefighters working at the scene. The bulk of the fire was knocked down with 7 minutes of arrival. No civilian or firefighter injuries were reported. Fire loss is estimated at $35,000. The cause of the fire appears to be accidental and started when combustible products came in contact with burning incense. Although fire damage was limited to just the one apartment, six family units will be displaced because gas and electric utilities were shut off to the building. Those displaced include 8 adults and 7 children. The County Citizen Services Unit is working with apartment complex management to restore as many units as possible to limit the amount of time the families will be displaced. A Bladensburg man, a former Riverdale volunteer firefighter, was arrested today and is being charged with First Degree Arson to a dwelling in Riverdale. Gerard McBurnie Dixon Jr. is charged with maliciously setting a fire to a dwelling at 4504 Kennedy Street in Riverdale on June 29, 2008. 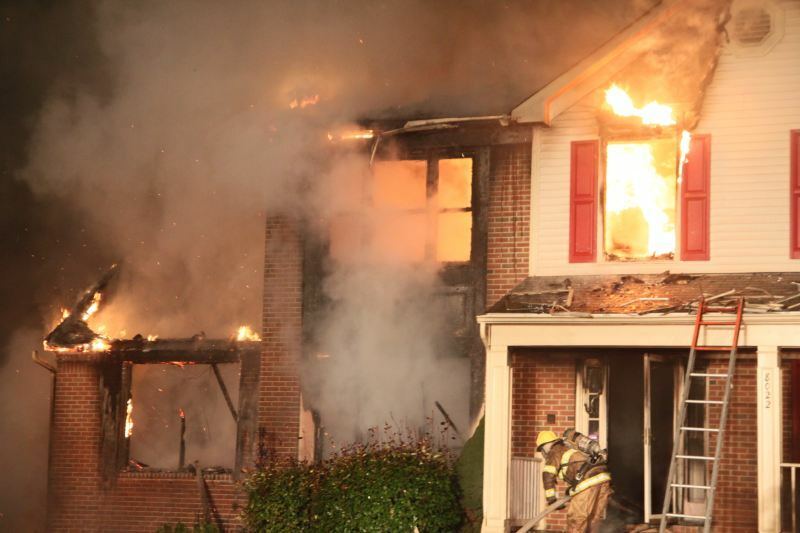 On that date, firefighters from the Riverdale Fire/EMS Station and other nearby stations were alerted to a house on fire at 3:25 am and arrived to find heavy fire showing. 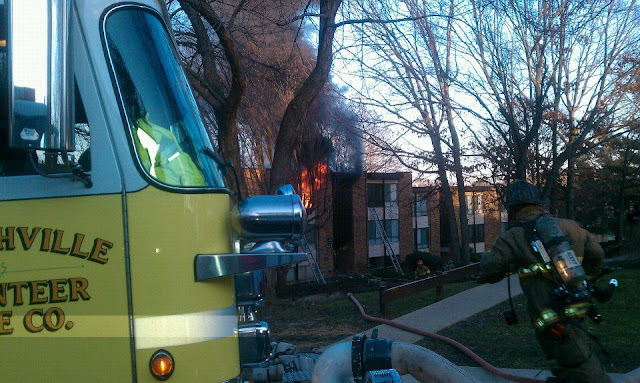 A firefighter sustained minor burn injuries while battling the fire. Gerard McBurnie Dixon, Jr., DOB of 9/21/88, was arrested out-of-state by law enforcement officials and is awaiting extradition back to Prince George’s County. 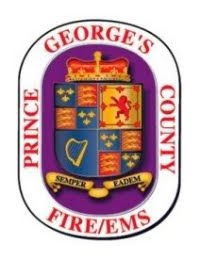 Prince George’s County Fire Investigators were assisted by Special Agents from the Bureau of Alcohol, Tobacco, Firearms and Explosives and the County Police Department in the investigation which led to the arrest. The investigation remains open and additional arrests are possible. First Degree Arson is a Felony and if convicted, Dixon could face up to 30 years imprisonment or a fine not to exceed $50,000 or both. Being as this is an open and on-going investigation, no additional information is available. No photo of the suspect is available. Prince George's County Fire/EMS Chief Marc S. Bashoor spent a large portion of his time on Monday and Tuesday visiting Fire/EMS Stations greeting personnel and presenting awards. In addition to greeting career, civilian and volunteer personnel he presented Emergency Services Awards, Fire Storm Awards and engaged the personnel in an open question and answer session. During these two days Bashoor visited 4 Battalions, 7 Fire/EMS Stations, greeted personnel from 16 Fire/EMS Stations that include just over 100 career, civilian and volunteer personnel. He awarded 12 Emergency Services Awards and 8 Fire Storm Awards. Bashoor found the time to attend a Public Safety Breakfast at the Laurel Fire/EMS Station #810 on Tuesday morning. Fire Storm Awards are plaques which commemorate what is believed to be the busiest day in the Prince George's County Fire/EMS Departments history. On February 19, 2011, high winds and dry conditions sparked seven major incidents that sent all 45 Fire/EMS Stations into action and required mutual aid assistance from jurisdiction across the State of Maryland, Virginia and the District of Columbia. Every Fire/EMS Station will receive a plaque to be prominently displayed in the station to commemorate the date. Prince George's County Fire/EMS Chief Marc S. Bashoor presented several Emergency Services Awards to deserving, career and volunteer, members of the Department for their actions on a house fire in Lewisdale. On Sunday, November 27, 2011, these personnel were crew members onboard fire apparatus from several companies which responded to a house fire at 2411 Griffen Street in the Chillum-Adelphi area. 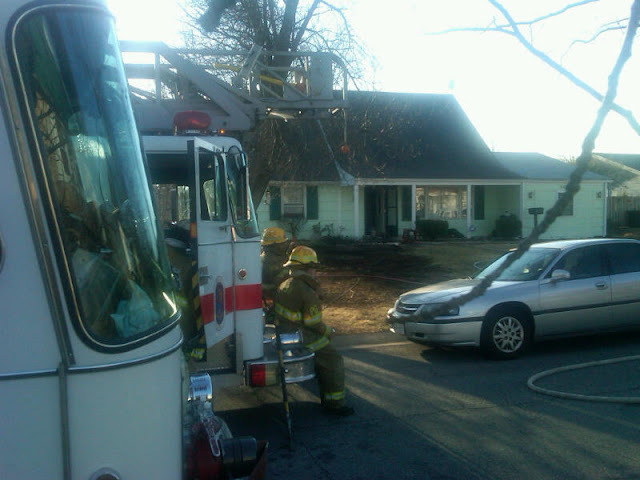 On arrival, crews encountered a working fire with three victims possibly trapped inside the residence. Some personnel entered the premise ahead of the hose line and searched in high heat conditions with low visibility while one took command of the incident and than proceeded to transition his abilities from incident commander to firefighter to paramedic throughout the course of the incident. Firefighters located three unconscious victims in different areas of the house and with the assistance of other crew members, removed the victims to the exterior of the house to awaiting EMS units. Despite the outstanding efforts of all personnel on the scene, sadly, all three victims succumbed to their injuries after arriving at the hospital. 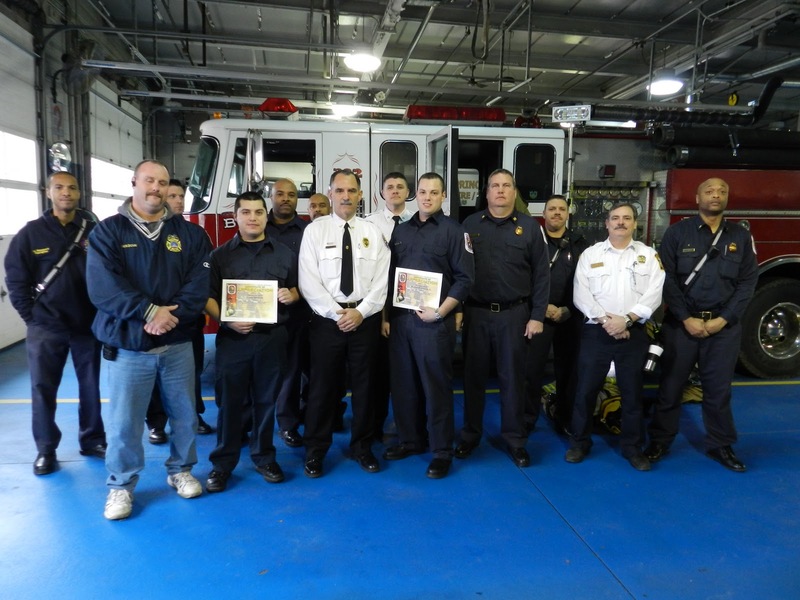 Fire Chief Bashoor was able to personally greet and present Emergency Services Awards to personnel from Chillum, Hyattsville and College Park on Tuesday, January 24. In making the award presentations he stated, "For your performance on the scene of the aforementioned incident, you are hereby presented a Fire/EMS Department Emergency Service Award. Congratulations and thank you for a job well done! Your actions represent the excellent service our Department strives to provide to the citizens of Prince George’s County." Volunteer Firefighter recipients from Hyattsville and College Park with Hyattsville Volunteer Chief David Hang, College Park Volunteer Chief Bill Corrigan, Fire Chief Marc Bashoor, Deputy Fire Chief Neal Dennis, Major Paul Cruz and Major Adon Snyder. On Tuesday, January 24, 2012, Prince George's County Fire/EMS Chief Marc S. Bashoor presented an Emergency Services Award to Branchville Volunteer Fire Fighter John "Derek" Daves. In making the presentation Bashoor stated, "In making awards presentations, it's not always about the end result, which in this incident was tragic, but the actions of the individual or group that made the effort and did the best that they could do under the circumstances." On the evening Friday, November 4, 2011, while on your way home after working Bingo at the Branchville Volunteer Fire Company and Rescue Squad, Inc., you witnessed a horrific three-vehicle crash on eastbound Route 50. There were a total of six passengers involved in the accident, four adults and two children. The two children were trapped in a burning vehicle that had burst into flames after being struck by another vehicle. You notified 911 of the incident, and without the protection of fire fighting gear or protective equipment, you immediately advanced to the burning vehicle. Hearing the screams of the bystanders alerting you of the trapped children and in an effort to access them, you aggressively attempted to open doors or break out the windows. However, the intensity of the fire, combined with thick black smoke and extreme heat, forced you to retreat without being able to make the rescue. You painfully described seeing the two children inside the burning car as a vision that will be indelibly etched in your mind. It was later determined that the damage to the vehicle was so severe that access would only have been possible with the heavy-duty hydraulic equipment that is typically used by firefighters. You acted without hesitation or concern for your personal safety, while attempting to save the lives of the two young victims. As a result of your actions, you sustained some minor burn injuries to your hand and exposure to the intense heat and thick smoke. Chief Bashoor presented the award saying, "For your performance on the scene of the aforementioned incident, you are hereby presented a Fire/EMS Department Emergency Service Award. Congratulations again, and thank you for an outstanding job. Your actions represent the excellent service our Department strives to provide to the citizens of Prince George’s County." Fire Chief Bashoor and Derek Daves. The award presentation was attended by Derek's wife; Tracey, co-workers from the City of College Park, PGFD Majors Cruz and Snyder, PGFD Deputy Fire Chief Neal Dennis and several volunteer members from Branchville. On Tuesday, January 24, 2012, Prince George's County Fire Chief Marc S. Bashoor presented an Emergency Services Award to Fire Fighter Michael Shipp. The award presentation was made at a brief ceremony at the District Heights Community Fire/EMS Station. A letter accompanying the award stated; On Friday, August 12, 2011, you were a member of the crew onboard the ambulance from Morningside Fire/Emergency Medical Services (EMS) Station 827, which was transporting a patient to Prince George’s Hospital Center. The unit was near the intersection of Forestville Road and northbound Route 95, when you noticed a cloud of dark smoke and what appeared to be flames underneath a Hummer SUV. You promptly contacted Public Safety Communications, advising them of the matter and requesting additional resources. The SUV’s driver was engaged in conversation on her cell phone, making it difficult to alert her to the situation. Upon finally getting her attention, the woman remained on the phone and even accelerated before eventually pulling onto the right shoulder. She did not readily believe the SUV was on fire and had to be physically removed from the vehicle. After realizing you were telling the truth, she proceeded to the ambulance, where the crew kept her out of harm’s way. Meanwhile, you made every effort to put out the flames with a fire extinguisher. Your quick thinking and immediate action are directly responsible for changing the outcome of what potentially could have been a tragedy. In making the award presentation, Fire Chief Bashoor stated, "For your performance on the scene of the aforementioned incident, you are hereby presented a Fire/EMS Department Emergency Service Award. Congratulations and thank you for an outstanding job! Your actions represent the excellent service our Department strives to provide to the citizens of Prince George’s County." Fire Chief Bashoor, Fire Fighter Shipp and his daughter at award presentation at the District Heights Fire/EMS Station. Story that aired on NBC 4 News the day of the incident.